There's good, not so good and bad news in the latest ECB stress test of Greek banks. The good news when it comes to banks in Greece - the same banks that 3 years ago were on the verge of default, and only draconian capital controls and a tactical ECB backstop which also took the nation hostage as it threatened to break away from the Euro, prevented a terminal bank run - is that they have emerged unscathed following the European Central Bank's latest stress test, giving European bureaucrats one less worry as they plan for the end of the nation’s latest bailout in August. The not so good news is that, as Goldman admitted, the entire thing was a farce to begin with, or rather more of a farce than usual. First, the test was much less severe than the scenario modeled by the ECB in its 2015 stress test of the Greek banking system, which assumed the economy shrank as much as -6.8% in a single year. This time around, the worst GDP drop was -2.1% for 2019. This is what Goldman's Pawel Dziedzic wrote two days ago previewing the stress test outcome: "Stress test assumptions seem milder compared with past reviews, thus reducing the risk of a disproportionately demanding adverse case scenario. The approach is underpinned by the improving macro outlook and the ‘precautionary’ nature of previous exercises." Of course, the only reason the outlook is improving is thanks to 3 years of ECB QE, which has collapsed European bond spreads to record levels, and which as BofA showed yesterday, is starting to lose control as markets begin to price in the tapering of the ECB's QE. Furthermore, there was no pass or fail level in the exercise and the ECB said any recapitalisation decision would be "taken on a case-by-case basis, after assessing each bank’s situation in the light of the results of the stress test and any other relevant supervisory information." In other words, the whole point of the confidence-building exercise was the pass every participant, not risk failing even one. ... Greece’s four biggest banks would take a €15.5BN hit to their combined capital ratios. Furthermore, under the rules of the ECB’s far more draconian 2015 stress tests, which required banks to maintain a CET1 ratio at least 8% in the adverse scenario, three of the four banks would have failed the latest exercise: Piraeus, National Bank of Greece and Eurobank. On the other hand, the stress test was gamed so carefully, that even this "adverse scenario" would leave the banks' common equity tier one ratio above the unofficial 5.5% hurdle rate used by the ECB in recent years. Another chart from Goldman showed the alleged improvement in the Greek banks' CET1 ratio since the collapse days of 2015. Ironically, since then, virtually nothing has changed, and yet the banks are somehow "perceived" as much stronger. 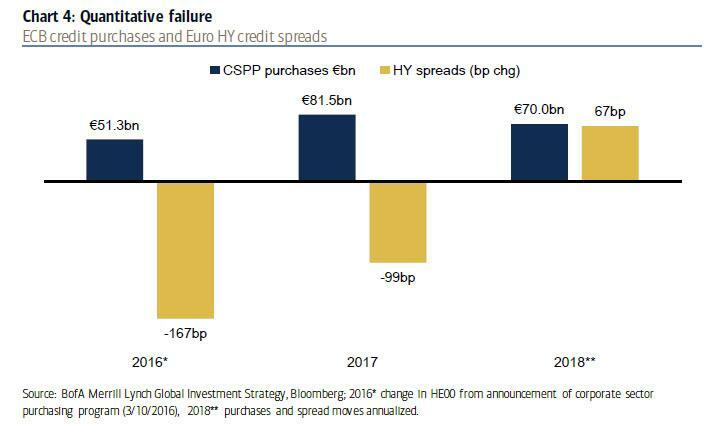 So, as a result of Piraeus Bank, National Bank of Greece, Alpha Bank and Eurobank Ergasias all "passing" the stress test, it means that almost €20 billion set aside to shore up the lenders is now free for other purposes, such as repurchasing debt from the IMF or ECB. What will most likely happen is that the fund will mysteriously be syphoned off by the Greek political oligarchy into various offshore accounts or cryptos, and squandered otherwise just as efficiently. Senior Greek officials were naturally delighted by the results, and quoted by the FT said the outcome of the exercise meant there was “no immediate need for a capital increase by any bank”. However, one official said that while the banks were out of immediate danger they still needed to clean up their balance sheets and several were likely to raise capital soon — notably Piraeus Bank, which emerged as a laggard in the tests. "The stress test have gone as well as we could expect," said one official, adding that they would ease Greece’s return to borrowing on international markets. He is right: perhaps Greece should go ahead and issue a 100 year bond next, since idiots managing other people's money have clearly not learned anything from the recent Argentina fiasco. 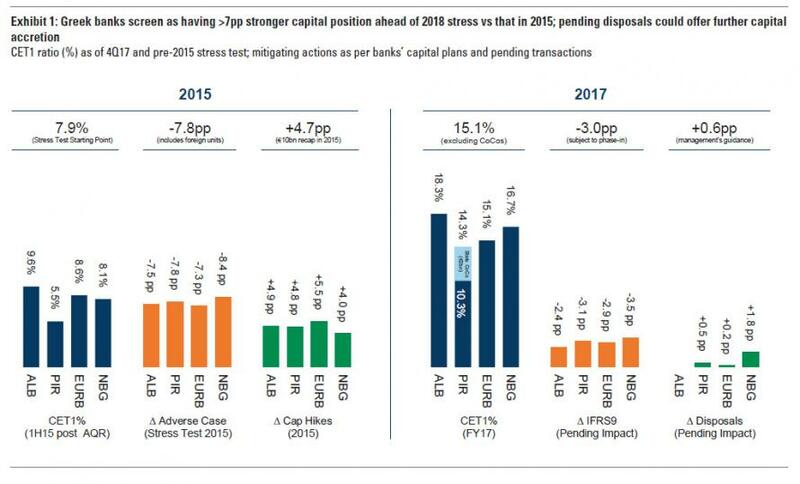 Looking at Greek banks on a case by case basis, Alpha Bank performed the best as its CET1 ratio declined from 18.25% at the end of 2017 to 9.69% at the end of 2020 in the adverse scenario. Demetrios Mantzounis, Alpha Bank’s chief executive, said the result “demonstrates the strength of our capital base”. 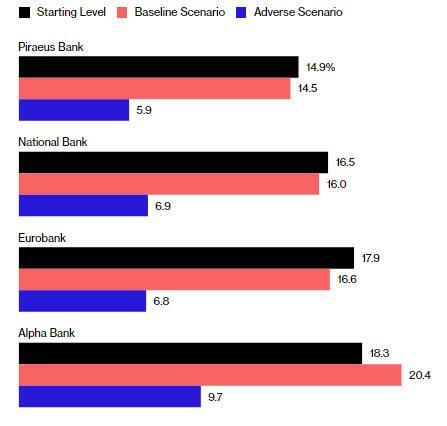 Piraeus Bank was the worst performer, as its CET1 ratio declined from 14.85% to 5.89% in the adverse scenario. Christos Megalou, chief executive of Piraeus, said the results “confirm that the market environment in Greece is tangibly improving,” adding that he was committed “to further strengthen Piraeus’ financial position”. According to the FT, Piraeus is expected to give more detail on its “capital strengthening plan”, including potential subordinated debt issuance and asset sales, when it reports quarterly results on Thursday. It is only in recent months that Greek banks - backstopped by the ECB for years - have started taking balance sheet clean up more seriously, and have tried to sell some of the billions in NPLs and toxic loans clogging up their balance sheets. Eurobank agreed to sell €1.5BN of unsecured consumer loans to Sweden’s Intrum last year, while NBG, Piraeus and Alpha plan to sell a total of more than €11BN of NPLs this year. Yet as the FT adds, these planned sales did not help them in the stress test, which was based on their static balance sheet at the end of 2017. The ECB said its adverse scenario modeled an average 8.5% point hit to the banks’ capital from increased bad loans. This is shown in the chart below: the average Greek bank has a total Non-Performing Exposure ratio of between 44% and 56%. This means that for all the lipstick, all Greek banks remain completely insolvent should the ECB's monetary backstops be withdrawn. Meanwhile, at the national level, the Greek NPE ratio as a % of all loans is at 47%, the highest on the continent, and higher even than in Cyprus. As a % of GDP, Greek NPEs of €108BN are now at 61%, the second highest in Europe. Still, it's better than the 78% of GDP observed just 2 years ago, so thanks to the ECB's QE there has been some improvement. A few final observations: the result of the stress test was widely leaked in advance, and reassuring remarks by Greek officials on the test outcome contributed to a >30% rally in bank share prices over the last month. 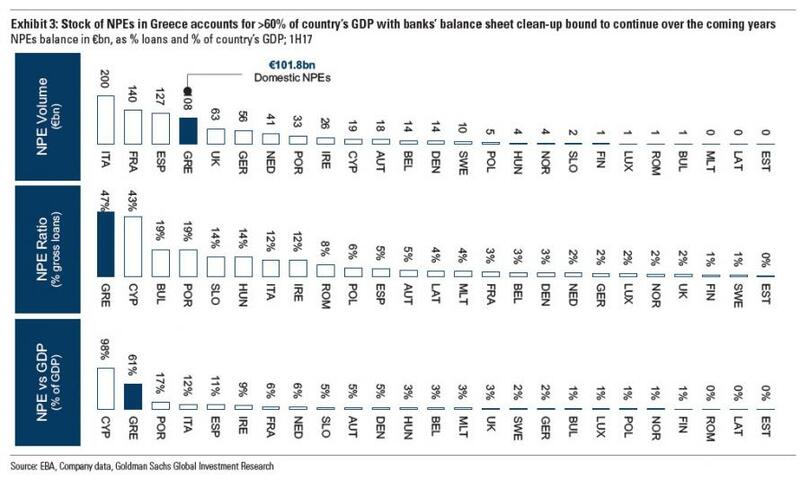 Even so, with the modest NPE improvement observed in recent years, Greece still has no clear solution to its banking troubles, because as Goldman concludes, while additional recaps could create buffers for asset quality risks, they are unlikely to resolve bottlenecks around the framework/infrastructure for bad-debt management. Prospects of a large scale recapitalisation combined with an unclear path to NPE resolution could increase the risks of a state bailout, which we would expect to be a relevant consideration for policy-makers ahead of the negotiations on Greece’s exit from the ESM programme.